I presented this theme to my students as ‘homework inspiration’ during their class break while travelling last year. The response was amazing so thought why not suggest this to Seiseki Umemura to use as one of his lessons. I haven’t spoken to anyone who did the lesson to see if they really enjoyed it but if it was me I would jump at the challenge to do something where two min features have to work together to form the focal theme of the arrangement. I suppose one could approach this theme a couple of ways: – maybe by following Book 3 Lesson 1, then applying squares made of unconventional material. 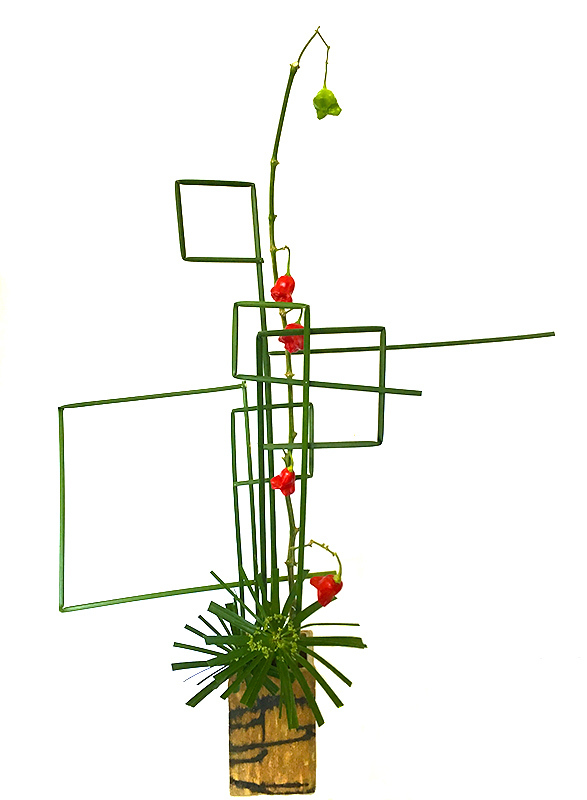 Another method could be form squares with the plant material and arrange in a vertical position. Whichever way you choose it will fit the brief.